First of all, let us take note of the fact that, Insurance is listed as a Union subject in the Seventh Schedule of the Constitution of India. Therefore, only Union Government has the authority to formulate laws on insurance sector and a State Government cannot. The Insurance Regulatory and Development Authority (IRDA) is a Statutory, autonomous and apex body to regulate the insurance sector in India. It was created upon the recommendations by the Malhotra Committee report of 1994. The report recommended that a independent authority to regulate the insurance industry in India should be established. By the IRDA Act, 1999 this authority was setup. In 2000 it received the staus of a Statutory body by the Parliament. 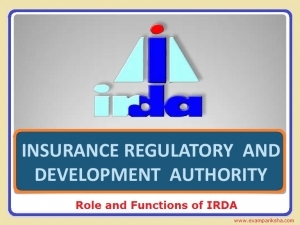 Therefore, IRDA was setup in 2000 as an autonomous body with its headquarters at New Delhi. In 2001, the headquarters of IRDA were shifted to Hyderabad, Telangana. New Development: Since July 2014 the FDI limit in the insurance sector has been raised to 49% by the government. Earlier it was 26 percent. The members and the Chairman of IRDA are appointed by the Government of India. To protect the interests of policyholders and ensure fair treatment to them. To facilitate speedy and orderly growth of the insurance industry sector in Indian economy, for the benefit of common man, and to give long- term funds which will accelerate growth of our economy. To ensure that the customers of insurance receive clear and correct information about the products as well as the services. The Insurance Regulatory and Development Authority (IRDA) is a national apex regulatory agency of the Government of India. It performs the following functions with respect to the insurance sector in India. It issues the certificate of registration or renewal to Insurance companies, insurance agents or surveyors, Insurance brokers. To function in the insurance sector, a company has to register with the IRDA. IRDA Protects the interests of the policyholders in matters like, nomination by policyholders, assigning of the policy, insurable interest, surrender values of the policy, settlement of insurance claim, and various other terms involved in the conditions of contracts of insurance. It specifies the requisite qualification, practical training, and code of conduct for agents, insurance brokers, and surveyors. IRDA is involved in promoting efficiency in insurance business conduction. It promotes and regulates professional organisations that connect with the insurance and re-insurance business. IRDA also specifies the code of conduct for surveyors and loss assessors. It regulates the fees and other similar charges levied by the insurance companies, brokers, agents, surveyors, etc. IRDA controls the rates, advantages, and terms and conditions which are offered by the insurers. It specifies the form and manner in which books of accounts are to be maintained by the insurers and other insurance intermediateries. It regulates the investment of funds made by the insurance companies and firms. IRDA settles disputes between insurers and intermediateries, whenever they arise. It also regulates the maintenance of margin of solvency(To possess sufficient funds to settle insurance claim amounts). It specifies the percentage of premium income of the insurer that can go to finance schemes for promotion and regulation of professional organisations. It also specifies the percentage of life insurance business and general insurance business that can be undertaken by the insurer in the social and rural sector. It supervises the working of the Tariff Advisory Committee also. IRDA has the power to frame regulations regarding the Insurance market. It promotes competition among the insurance companies and insurers in order to enhance customer satisfaction, by providing increased choice to consumers. Like it allowed Health Insurance Portability. IRDA is also involved in the field of Consumer education and assistance. The primary aim to form IRDA has been to create a regulator, that will be able to regulate and develop the insurance industry in the country, while also controlling all organizations or individuals who are directly or indirectly involved in the insurance sector. The Insurance Regulatory and Development Authority has been given the powers to issue such regulations that are related to the insurers, the insurance intermediaries, the surveyors, or any third party administrators. It canframe provisions for their registration, or renewal of their licenses as well as to review their functioning for smooth working of the insurance sector. The Insurance Regulatory and Development Authority is also entrusted with responsibilities of protecting the interest of the policyholders, for whom the insurance companies and intermediaries are issuing the policies. Even after these powers to regulate the insurance sector, the Authority remains accountable to the Central Government for its actions and inactions.